Welcome to issue #4 of Data Driven HR, which for this month is a double-issue on account of me spending the first two weeks of August in Singapore and Australia, and the coming two weeks on a much needed holiday. The past 12 months has seen a surge in companies forming people analytics teams. Bersin by Deloitte’s High-Impact People Analytics Study reports that 69% of large organisations now have a people analytics team. From my experience, many of these teams are still stuck at the reporting stage and based on my recent trip to APAC, many organisations are still fretting over data quality and believe that until they overcome this challenge, they can’t get properly started with analytics. Whilst I disagree with this belief – there’s no reason why data quality cannot be improved in parallel with undertaking people analytics projects, it is clear that it would be helpful to provide guidance on how this – and other challenges in people analytics can be overcome. As such, this issue of Data Driven HR highlights some of the best freely available research studies on the field. Together they provide a wealth of information, advice, case studies and inspiration that should help those working in the people analytics space, as well as those who want to learn more about one of the fastest growing areas of HR. I hope you enjoy issue #4. If you do, please share with your network and encourage them to subscribe! If you are in the early stages of your journey or looking to get started with people analytics, then this seminal study is a good place to start. It outlines ten steps grouped into three phases: i) setting your direction, ii) defining your approach, and; iii) growing your capability. The first three named authors went on to write The Power of People, which is a pretty good nudge to read this study. This series of research from LinkedIn Talent Solutions quite brilliantly illustrates the extent of the growth in people analytics and breaks it down by region too. Advice is offered on how to build a data driven function in HR, with an excellent case study from David White. A further case study from Chris Louie outlines a compelling example of people analytics in action at Nielsen. Read all three reports to help understand some of the regional nuances in terms of maturity, focus and challenges in APAC, EMEA and North America. A landmark study with 68 pages jam-packed with a critique on the state of people analytics (still too much ‘HR for HR’s sake’) plus methodologies for connecting analytics with business strategy and guidance on building organisational capability. There is plenty to inspire with several case studies really bringing the power of analytics alive. The link above is to the Executive Summary. You can download the entire report via OrgVue too. Josh Bersin outlines the rapid growth in people analytics, the increase in the number and range of data sources being used, and the consequent risk this poses to privacy and data security. The chapter highlights a potential blind spot (see Figure 2), where whilst organisations are actively managing the risks of using people data around employee perceptions and legal liability, only a quarter are managing the potential impact on their consumer brand. Read this article alongside Josh’s more recent appraisal of the field in The Rise of Talent Intelligence: People Analytics Accelerates. Ethics is arguably the most important element of people analytics and continues to be one of the biggest challenges facing practitioners. This is exacerbated due to technology – and the data it generates – moving in a direction too fast for legislation to keep up with and anticipate, and for employees and organisations to conceive. This research saw 20,000 workers in 44 countries surveyed for their perspective on data use in HR analytics. The results showed that within the ‘grey areas’, where legal precedent does not exist, or data ownership is unclear, context and culture matter most. A Case Study describing how IBM implemented its employee listening program Social Pulse is provided along with recommendations for organisations and employees on the use and availability of data. This research from the CIPD provides a host of insights, not least that strong people analytics culture leads to positive business outcomes as well as Figure 4 below, which suggests that confidence in conducting analysis varies significantly in the regions covered by the research. This report contains a host of interesting research findings as well as outlining four recommendations to move people analytics forward: i) focus on talent on the team, ii) integrate far and wide, iii) invest in technology and tools, and iv) build trust through incremental success. 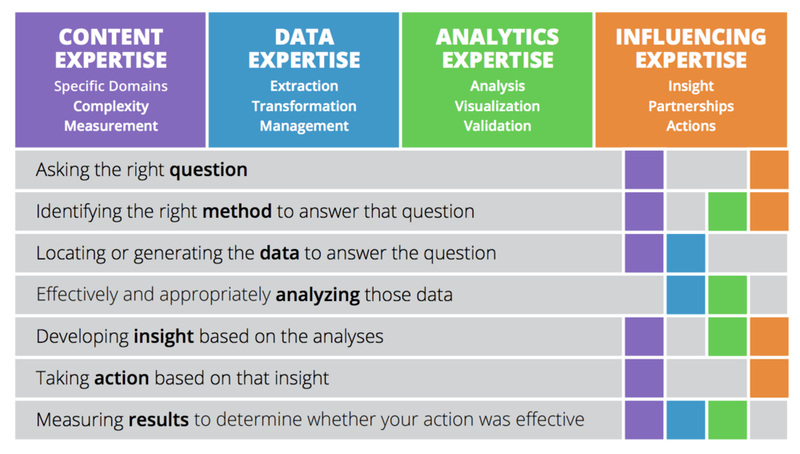 It also features valuable insights from a host of people analytics leaders including: Arun Chidambaram, Charlotte Nagy, Guru Sethupathy and Alexis Fink (see Figure 5 below, for the model Intel developed to outline the expertise required at different stages of the people analytics process). The most recent of the research studies listed here, and a valuable addition too. The main findings include: i) profit margins of organisations with advanced people analytics capability are 56% higher than those of less advanced, ii) building an organisation-wide data-driven culture is critical, and iii) most projects are still focused on HR effectiveness rather than business outcomes. 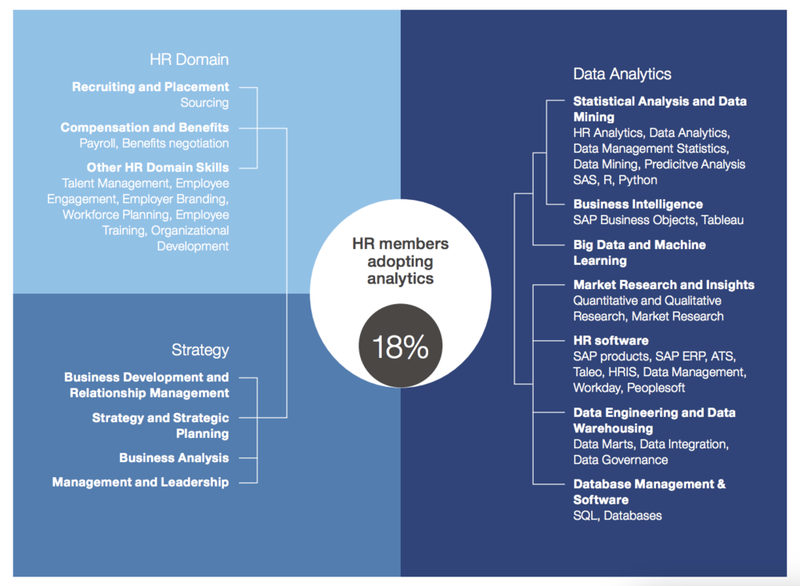 Whilst this white paper provides a stark analysis on the state of people analytics in 2016, it does provide HR with some helpful home truths, which if the function doesn't address may lead to companies situating people analytics outside HR. The three primary areas of deficiency highlighted are i) most organisations are still only doing basic analyses (see Fig 6), ii) poor data quality, and therefore unsurprisingly iii) a lack of confidence by the business in these fledgling people analytics functions. The article that arguably started it all and undoubtedly the one that brought people analytics to the attention of a wider audience – and certainly me. The commentary, advice and case studies highlighted in this seminal HBR article still resonant today. This white paper provides a critique of the HR centric approach adopted by many organisations when it comes to analytics, instead advocating an “outside-in” method targeted at solving real business problems. Two excellent examples from Maersk Drilling are highlighted to support the argument. Case 1 examines the impact of leadership quality and crew competence on safety, operational performance, and customer satisfaction whilst Case 2 examines the ROI and Strategic Impact of a Technical Trainee Acceleration Program. Both cases show that analytics is far more effective when tackled from a business (rather than an inward looking HR) perspective and that analytics needs to be treated as a change management process. The headline finding of this study was that whilst demand from the business for workforce data and analytics is high and CHROs are increasingly supportive, HR functions – particularly in Europe – are lagging behind. The slide deck here, which I presented at UNLEASH, highlights some of the key findings. Whilst only accessible to Bersin by Deloitte members and therefore the only entry on this list that is not free to download, I have included it with the advice to seek it out and beg, steal or borrow a copy. Highlights include theseven top findings for driving high-impact people analytics and also a dramatic update and overhaul of Bersin’s infamous people analytics maturity model (you can view both in Josh Bersin’s article here: People Analytics Finally Grows Up). Want to learn more about People Analytics and Design Thinking in HR? 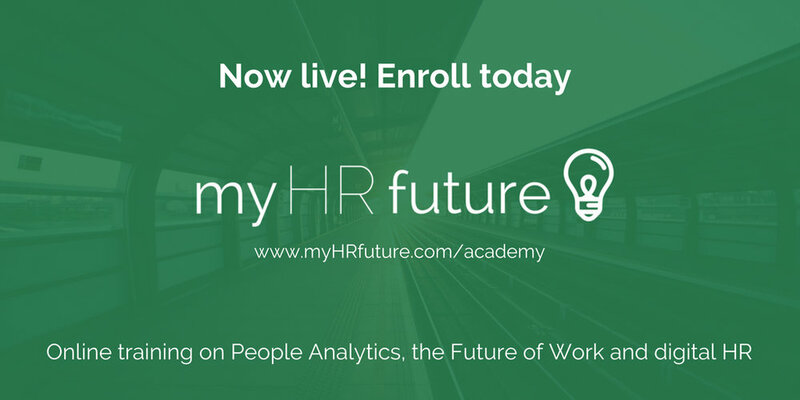 This month saw the launch of the first two courses on the myHRfuture academy. Jonathan Ferrar and I collaborated on ‘An Introduction to People Analytics’, whilst Volker Jacobs and his team at TI People provided a course on ‘Incorporating Design Thinking into HR’. Check out the courses here.